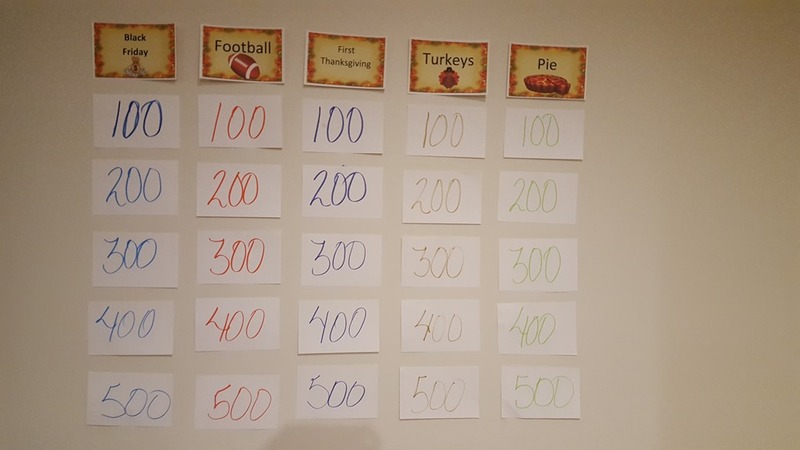 Looking for a fun game to play with your family between Thanksgiving dinner and the Pumpkin Pie? You can download a pdf file of the Jeopardy game we used by clicking on the link below. It’s ready to print with 1/2 sheet question cards and a list of answers. Heading cards are on a half sheet and feature the graphics shown in the photo above. Take a quick look at the questions before printing and make sure they are still applicable. Happy Thanksgiving! This entry was posted in Black Friday, Family Fun, Games, Holiday Family Fun, Party Fun, Party Ideas, Thanksgiving and tagged Activities for family reunions, Black Friday trivia, family clipart, family gathering, family reunion, family reunion activities, Family reunion activity, family reunion awards, family reunion free website, family reunion freebies, family reunion ideas, family reunion invitation letter, family reunion party games, Family reunion planning, family reunion shirt, family reunion shirts, family reunion souvenir, family reunion t-shirts, family reunion web pages, family reunions resources, family reunions.com, Family-reunion-success, familyreunions, First Thanksgiving questions, ice breaker activity, plan a reunion, planning a family, reunion, Reunion activities, reunion free stuff, reunion freebies, reunion games, reunion services, reunions family, reunionsmag, thanksgiving activities, Thanksgiving family fun, thanksgiving fun, thanksgiving game, thanksgiving game ideas, thanksgiving games, Thanksgiving Jeopardy Game, Turkey games. thanksgiving ideas by Aunt Mo. Bookmark the permalink.